← Would you like to visit WI HQ? Our new Sotonettes Secretary, Alice, tells us a bit about her running career so far and the Running Group which she recently set up. I decided to set up the Running Group in February 2014 after yet another attack on a female runner on the Common. It felt unsafe to run there alone as I was planning to do and I thought the Sotonettes would be the perfect way for me to find some running buddies. I also wrote to the local councillors and MP for the area to complain about the lack of safety on the Common as attacks happens there far too regularly, on both males and females. I can’t say this has been too successful yet, but it is ongoing and we are trying to work on campaigning to Reclaim the Common! If you’d like to know more about this campaign, read our blog posts here and here. By no means am I a pro runner – from starting out slowly on a treadmill last year, I moved onto doing the Couch to 5K app; this is a NHS initiative to get people moving and is free. I then branched out into running outside in January of this year around my local area in Shirley. From those humble beginnings, I am proud to say that I have just completed a 10k race! 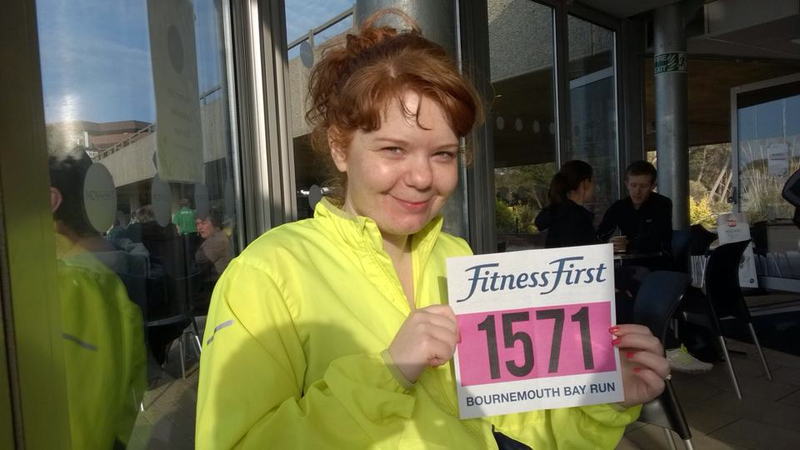 This was the Bournemouth Bay Run for the British Heart Foundation, for which I raised £240. I’m so proud of this as I don’t find running easy at all – it’s been really challenging but I have enjoyed the buzz afterwards, the ‘runner’s high’, and feeling myself get fitter as I run further each time. The Sotonettes Running Group meets on Sunday mornings at the Cowherds on the Common. So far, we have stuck to the same route which is an easy 3k around the Common. We organise ourselves through a Facebook group – click here to join it and find out when we’re next running! If the Sunday is no good for you, I’d be interested in going one weeknight too and this could be arranged if there is enough interest. I’ve also attended the Parkrun 5k on the Common – this is held every Saturday morning (the 9am start is painful though!). I really enjoyed it; there is a really good atmosphere of everyone running together and I wasn’t the slowest, which was a relief! There’s no competitiveness there, it’s all for the fun of it. If you’d like to join us, please do come along on a Sunday morning, or contact us for any more info!